The incidence of port-site hernias (PSHs) has increased, with laparoscopy becoming the standard of care. Tonouchi et al. first reported port-site hernia as a complication following gynecological laparoscopy in 1968. Swank et al. published a systematic review of laparoscopic procedures in 2016 and stated that the overall prevalence of trocar-site hernia is between 0% and 5.2%., We present two cases of port-site hernia through the lateral 5-mm port after a laparoscopic surgery. 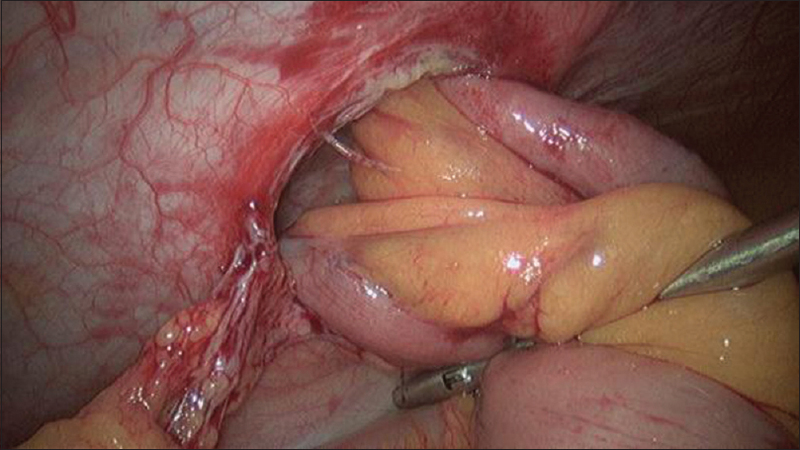 A 36-year-old woman underwent laparoscopic myomectomy for multiple uterine fibroids. A primary 10-mm supra-umbilical port along with three 5-mm lateral ports was used to perform the surgery. The left lateral 5-mm port was later converted to a 15-mm port for specimen retrieval. The surgery lasted for 302 min and sixty fibroids were removed. A full-thickness closure of the left lateral 15mm port was done using polyglactin suture. On day 2 of surgery, the patient developed nausea and vomiting not relieved with antiemetics and prokinetics. 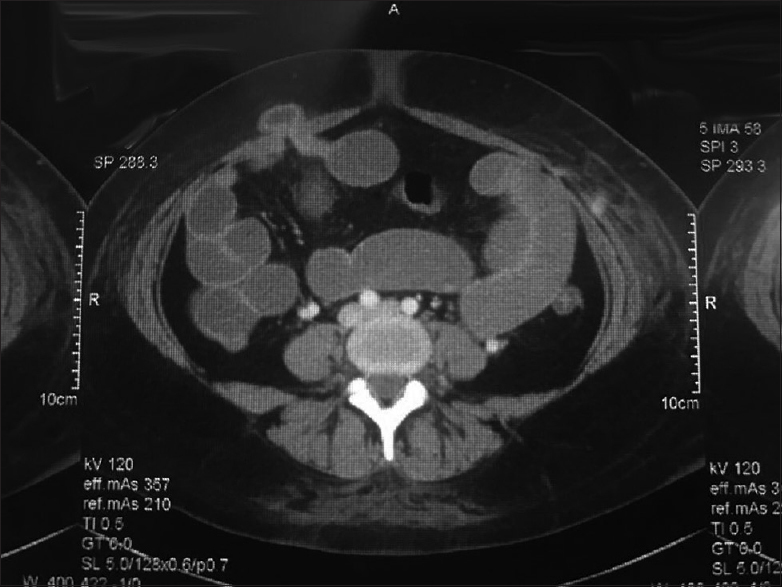 Computed tomography scan revealed a right para-umbilical full-thickness abdominal defect measuring 1.7 cm × 1.0 cm containing a short segment of the small bowel [Figure 1]. Laparoscopic evaluation showed a 4–5-cm ileal loop herniating through the right lateral 5-mm port [Figure 2]. The bowel loop was freed from the peritoneal defect and the hernia site was repaired. As the primary surgery was prolonged and the uterus was being manipulated from the lateral ports, fascial necrosis could have occurred and led to widening of the incision and subsequent herniation of the small bowel. While performing a total laparoscopic hysterectomy for a 42-year-old woman, it was noticed that a small part of the plastic cannula in the left lateral port had broken and was lodged in the subfascial tissue. The fascial incision was extended to remove the broken piece and not sutured subsequently. Three weeks later, the patient presented with complaints of pain on the left lower port site. Ultrasound was suggestive of a left lateral abdominal wall hernia of small bowel loops and mesentery in between the subcutaneous fat and muscle layers. 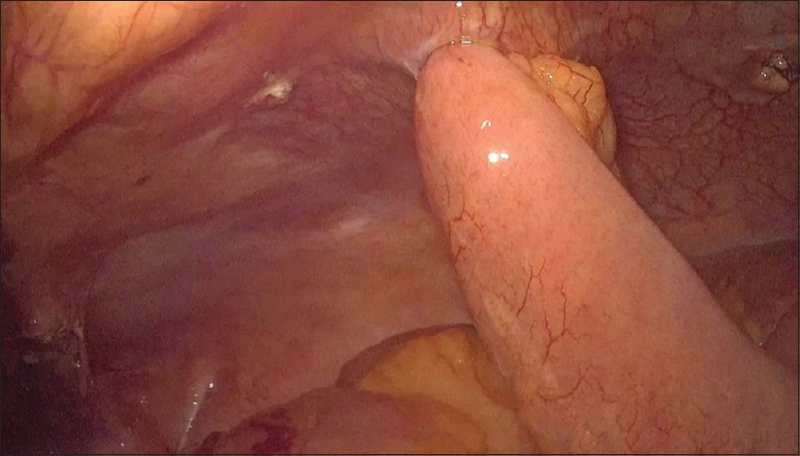 Laparoscopic evaluation showed a 5-cm peritoneal defect with ileal loops surrounded by inflammation and dense adhesions [Figure 3]. Any extension of the incision during the primary surgery should have warranted a port closure and hence we acknowledge the role of an iatrogenic PSH in this case. Various case reports and case series in literature currently suggest the routine closure of fascial incisions ≥10 mm. At our center, we routinely use a 10-mm supra-umbilical primary port and three 5-mm lateral accessory ports for major gynecological laparoscopies. The left lateral port is extended up to 15 mm for specimen retrieval, if required, followed by a full-thickness closure using a delayed absorbable suture. Since 2002, we have performed around 6837 gynecological laparoscopic procedures with only two patients developing PSH (0.03%) – mean follow-up of 12 months. In our experience, not only fascial but also full-thickness closure of any incision ≥10 mm should be done as it reduces the risk of PSH. Age >60 years, high body mass index, associated comorbidities, and preexisting supra-/para-umbilical hernias can increase the likelihood of development of PSH., Increased surgery time, prolonged manipulation, and stretching of ports to retrieve specimen can lead to fascial necrosis and increase the chances of PSH in incisions <10 mm. As PSH is a preventable complication, an individual risk assessment and decision for port closure must be made at the end of each laparoscopy procedure, irrespective of the size and site of ports at the onset of surgery. Bunting DM. Port-site hernia following laparoscopic cholecystectomy. JSLS 2010;14:490-7. Nezhat C, Nezhat F, Seidman Ds, Nezhat C. Incisional hernias after operative laparoscopy. Journal of Laparoendoscopic & Advanced Surgical Techniques 1997;7:111-5. Swank HA, Mulder IM, la Chapelle CF, Reitsma JB, Lange JF, Bemelman WA, et al. Systematic review of trocar-site hernia. Br J Surg 2012;99:315-23. Yamamoto M, Minikel L, Zaritsky E. Laparoscopic 5-mm trocar site herniation and literature review. JSLS 2011;15:122-6.